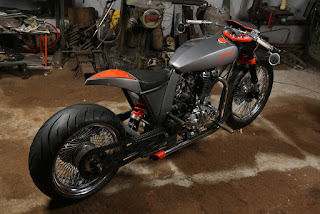 Over the last decade and half, we have witnessed enormous growth in custom motorcycle building scene in India, with innumerable individuals painstakingly applying stylish and structural alteration to their off-the-rack models and surprised us with their mosaic works! 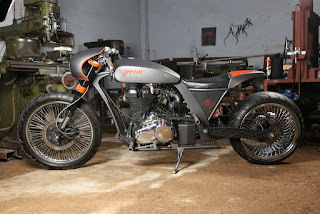 However in India, Royal Enfield is probably first call to chose a donor bike to remodeling for any XYZ bike builder, but what makes the different for Delhi based TNT Motorcycles,they humbly rejected each parts of the bike but the engine! 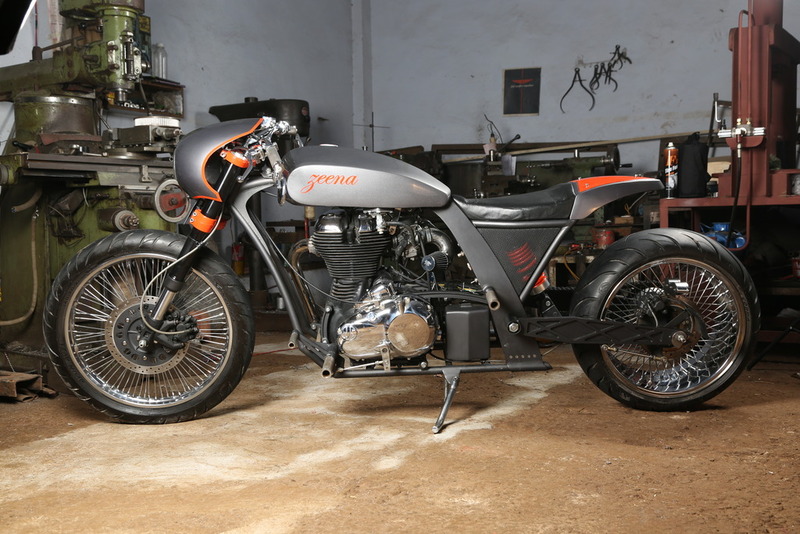 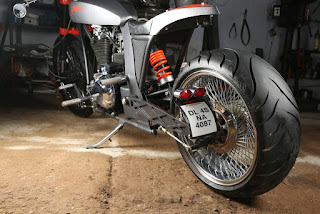 A 500cc Royal Enfield Engine was used ti buit their first mod : Zeena! 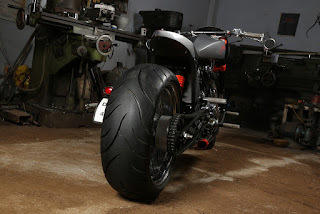 Hear it from TNT Motorcycles “Zeena is our first customer build done for a merchant naval Captain Sahil Lamba. It’s based upon a RE500cc classic donor motorcycle. Other than the engine, wheel hubs and front disk nothing has been borrowed from the donor bike. Front suspensions are inverted shocks from Endurance. 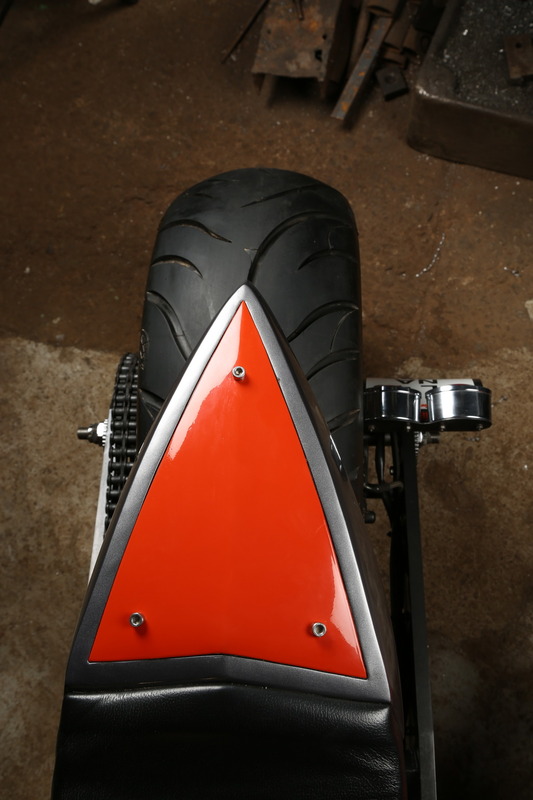 The rear mono-shock has also been supplied by Endurance but is stiffened with a spacer for lesser travel and added weight. The top tree plate has been milled out from aircraft grade aluminium alloy Duralumin. The chassis is hand built on a jig which sports a double down tube with a single backbone. 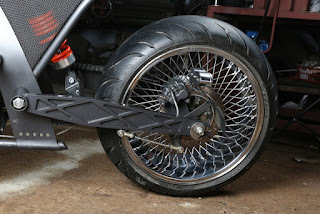 The backbone joins the lower part of the chassis with a hydraulically bent flat element which houses electricals inside. 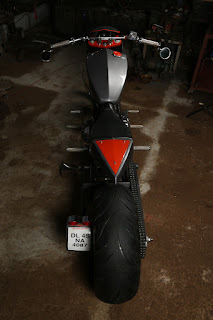 Engine is again coupled with one off TNT trademark engine fittings. 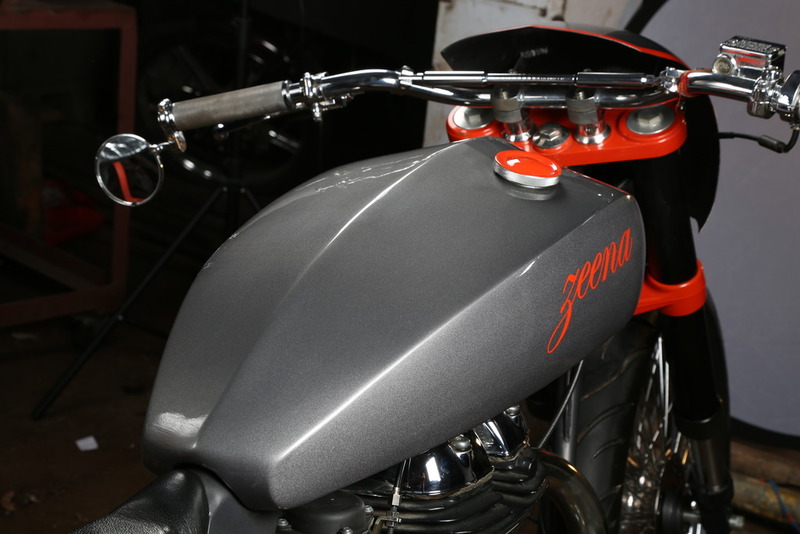 Fuel tank is stretched out from our trademark “shunya” tank shape sporting a cafe class look and so is the front scoop. 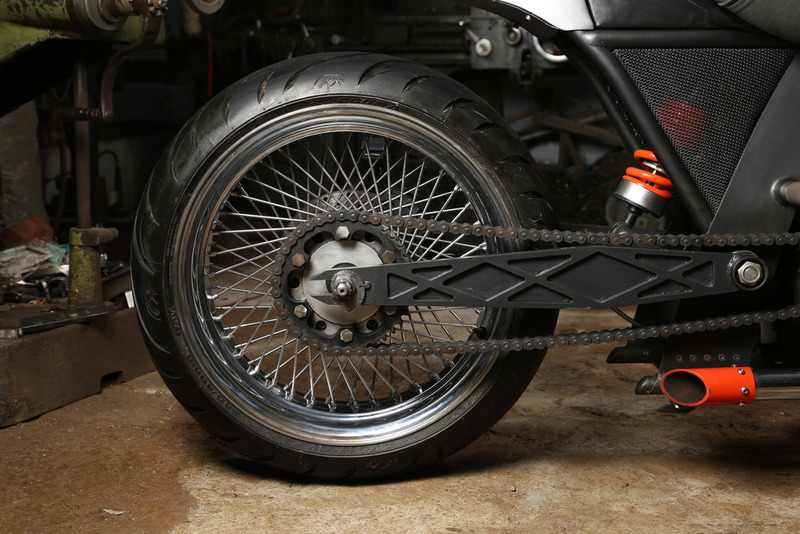 The bodywork is also accessorised with a SS mesh element which houses rear mono-shock top fitting. The front rubber is a 120mm wide 21 inch Avon coupled with a 240mm wide 18 inch Avon. A mono-bearing housing has been engineered for secondary drive. 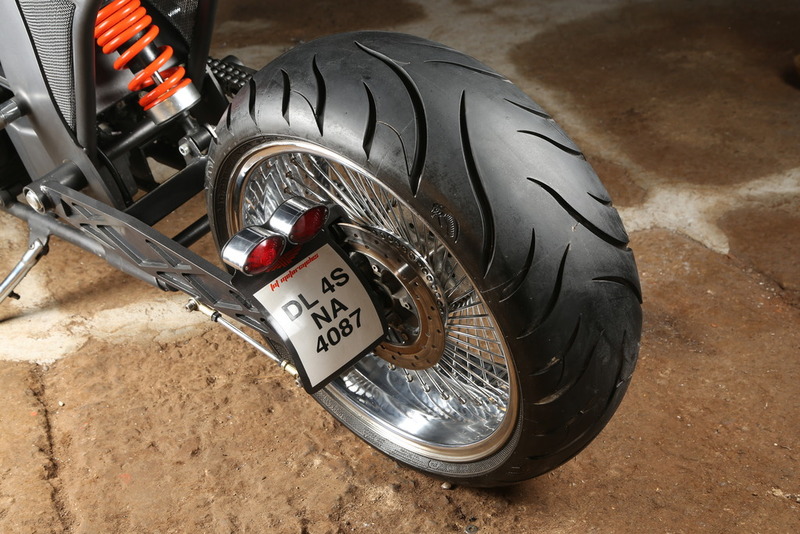 A duplex chain pulls the massive 240 tyre with 80 spoked clock-anti-clock rim assembly.